Triangular shapes can be sticklers to piece! Quilt patterns with 1/2-square and 1/4-square triangles are found in many traditional quilt pattern designs. Here’s how to take the hassle out of creating triangles, in particular 1/4-square triangles. For more details watch the second episode of No-Hassle Triangles Quilt Blocks online. This 12-block quilt features both 1/2- and 1/4-square blocks. 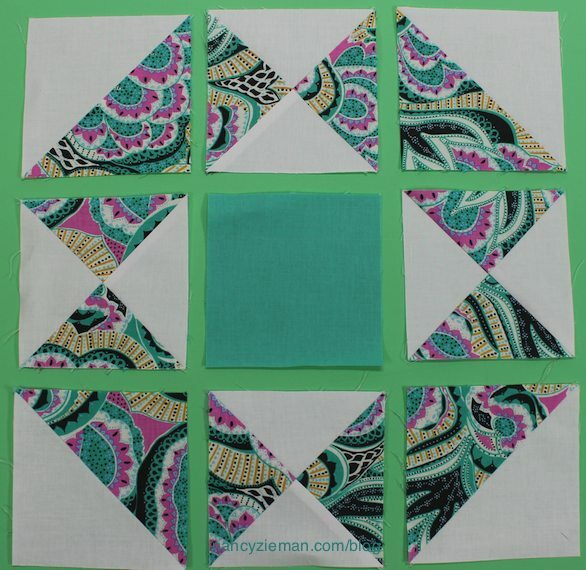 In a previous blog, Nancy Zieman featured six of the 1/2-square triangle blocks. Now learn how to combine the two block styles to create amazing quilt designs. Note: The instructions to create this quilt are found in No-Hassle Triangles Quilt Blocks book. Some quilt block names have a long history; others are simply made up on the fly! We’ll let you decide the authenticity of this block named the 1/4-Square Dance! Regardless of what it’s called, it’s the perfect block to begin our no-hassle quilt block journey. This quilt block named, Boy’s Nonsense, was officially recorded and appears in print in 1898. The block appears to include rectangular strips. Not so, the design is a combination of 1/2- and 1/4-square triangles plus a plain center square. It might be difficult to comprehend, but the next block, Silent Star, is almost identical to the last block, Boy’s Nonsense. The main difference in construction is the center block—all the other blocks are the same. This is the case where fabric choices totally change the design! Simple in design, yet elegant, the Ohio Star quilt block has been in use since the early 1800s, with a spike in popularity in the 1930s. See how this 9-patch block can be made the no-hassle way in the 21st century. Now for your master’s degree in 1/4-square triangles! The Star of Hope combines a 1/2- and 1/4-square triangle; Nancy called it a modified 1/4-square. Notice the three-color block of aqua, ivory, and teal. Success comes by thinking this through and following the directions! The Card Trick Quilt Block, like most magic, seems impossible to reproduce. What appears as sleight of hand, is a very logical block to create once you see the elements. The Card Trick—we know you will not be fooled by the design! There are several ways to make triangles; our preference is to use the No-Hassle Triangles Gauge. Reference the left side of the gauge for 1/2-square triangles and the right side for 1/4-square triangles. Depress and slide the guide to the size triangle you’d like to make. The guide will lock in place. Cut strips the size printed on the gauge. Then cut strips into squares. In this example, cut 6-1/4″ strips, then cut strips into 6-1/4″ squares. Mark center diagonal line through the die-cut openings on the No-Hassle Triangles Gauge. Stitch a scant 1/4″ from each side of center. Stack two 1/2-square triangles, meeting opposite colors. Slide the gauge to the 1/2-square triangle marking on the left side. Double check that the block fits within the gauge perimeters. Mark center diagonal line through die cut openings. Cut along center marking; press. This time, you’ll have two accurate 1/4-square triangles! Using the No-Hassle Triangles Gauge guarantees that the sizes of the 1/2-square and 1/4-square triangles are compatible in a quilt design! The No-Hassle Triangles Quilt Blocks book shows exactly how to make the 12-block sampler quilt. For best results, use the No-Hassle Triangles Gauge. For a chance to win a copy of the No-Hassle Triangles Quilt book, tell us which of the 1/4-square or 1/2-square blocks you would like to make. I love so many of them. But Card Trick!!! I’d like to try Flying Geese and Ohio Star. I’m hoping to combine other triangle favorites she posted (like opposing triangles) to make a sampler quilt that is Queen size. I’m just starting with one row at a time! Card trick is my favorite. I like the Card Trick Block. The card trick square looks like it is the most difficult, so I would like to try making it. I would like to make the 1/4 Square Dance. I have never made card trick blocks and would love to try both versions in your book. one. Thanks. I would like to win the book or buy it. Would LOVE to make the card trick block! All of the blocks are interesting but the Star of Hope and Card Trick are my favorites. It is amazing how different fabrics and placement can completely change the look of a block. I would LOVE to try the card trick block. They all look fun though. I would like to complete an entire sampler of half square triangle blocks! I like to try different blocks so that the project is challenging! I would like to make the star of hope square. It’s a tossup between Card Trick and Star of Hope. The Star of Hope would be beautiful in a Quilts of Valor quilt. I like the Ohio Star turned on the angle like a windmill. Very pretty. i love the versatility of the card trick! Thank you for the give-away. I would definitely love to make any of those blocks but the Star of Hope seems appr4in todays world. I am very new to sewing quilt blocks. I love all of the above blocks and am anxious to try them all, one at a time, of course. I would like to make the card trick with the tool. I love the Star of Hope. It is so unique. I like all kinds of stars, but the Star of Hope is interesting and I haven’t tried that one yet. The Card Trick first and than the whole quilt if I win the book. Thanks for the give away. The card trick block has always intrigued me. You have made it so simple! Will give it a try. I’ve always liked the Card Trick block but so far I’ve never made one. I like the Star of Hope block–very pretty! I’ll will be making “Star of Hope” as a 6 month double lung transplant survivor & first granddaughter born 2018 it certainly represents HOPE. I’m doing 2 lap size quilts right now and I didn’t realize at first I had picked triangles for both! So I must love them and need to become better in different ones now. I must try the Card Trick! I would like to try the boy’s nonsense and the card trick. A friend and I are going to collaborate on a quilt and I think this book would be beneficial to us. 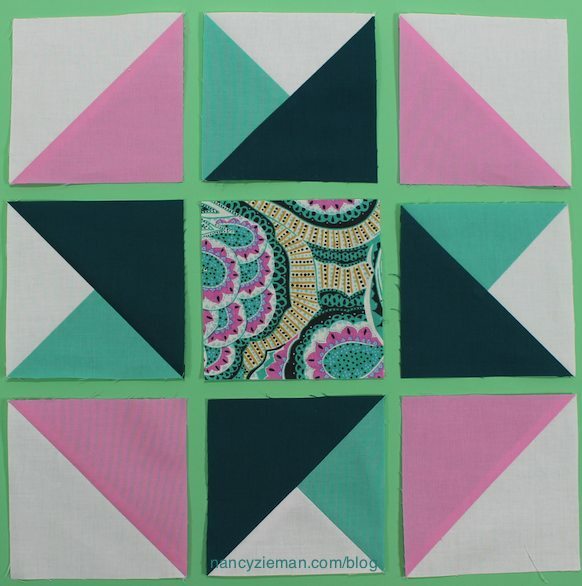 I love the sampler quilt, but I especially like the card trick and star of hope blocks. The card trick looks complicated, but I would still love to try it. I’d try that first. I would like to make Ohio Star and the Boy’s nonsense. The latter for my grandson. I would like to make the sampler quilt. I would love to win the book giveaway. Thanks! So many great blocks, but I am a fan of the Ohio Star. The Ohio star and the star of hope both interest me. I’m thinking that the star of hope could be made without the strips between the pieces, so I might have to try that. I definitely recommend the use of the ruler. It makes something difficult much easier! It’s amazing how the same fabrics can look so different depending on their cut and placement. So many designs to choose from but I would start with Star of Hope. It’s very difficult to choose but I think I like the card trick block the best. Always been partial to the Ohio Star block but like the silent star as well. What a great book and I love using the triangle gauge-makes marking the half square triangles so easy!! The spool would be my first choice, but I want to try them all. Silent Star would be my first choice to make. I like the Ohio Star best. I find it fascinating how turning the blocks makes different designs. I’d like to make Card Trick and Star of Hope. Thank you for such wonderful tutorials and continuing Nancy’s lessons. I like the Star of Hope both for the design and the name. We need that in these times. Card trick has always been a favorite of mine. This no hassle triangle tool will make it easy. It is hard to decide between Ohio Star and Card Trick. I love them both. The Card Trick is my new endeavour. Would like to make the Silent Star. It is a very regal looking design. All the blocks look amazing. I would like to make the card trick! I really like the silent star. Would like to make it my next quilt block. I would love to make them all but I would begin with the Card Trick block. Thanks! So many great choices! However, the Silent Star keeps calling to me! I love stars! I would make the Silent Star block. This would be an excellent book to add to my collection! I would to make the Star of Hope. I have always been intrigued by the card trick block. That is the first one I would make. I would make the Card Trick….this is the 1st time I’ve seen this block. it is very interesting. I have always wanted to try the Card Trick block. Now maybe I will!!!! Card Trick!! That’s one I hadn’t seen yet and looks fun! I would like to try them all! But probably Boys Nonsense first. The Card Trick block and the Star of Hope are very similar! With a “sleight of hand” and a couple of changes in direction of blocks, they can go either way. This is what I love about Nancy’s methods! they make everything easy and give us all confidence to create! - My favorite block is the Silent Star. I would love to make a card trick block and quilt. I volunteer with a FIRST robotics team called Aces High. I want to make the Card Trick block with the team’s colors and logos! I would like to make the Star of Hope. I like all of the designs in this sampler quilt. I love “Card Trick” and seeing it as you have shown it makes me know I can do it~! I would like to make the Star of Hope; and then all of the others! Very pretty quilt. I really like the Silent Star. I’d plan to make quite a few of these blocks in a quilt I am working on. I think I would like to make the Card trick block. It would be great to win this quilt book.